Connor Grey, a druid consultant for the Boston P.D., usually helps the cops solve their “strange” cases, but now he’s the suspect in the midst of one. Wrongly accused of a terrorist attack that rocked the city to its core, Connor evades arrest by going underground, where rumors of war are roiling. A final confrontation between the Celtic and Teutonic fey looks inevitable—with Boston as the battlefield. Undercover agents are turning up dead in the Weird—their murders brushed aside and ignored—and Connor exposes a citywide conspiracy of silence that seems linked to the inexorable march to war. As he digs deeper into the mysterious deaths, Connor draws closer to the secrets of a past he has sought for so long. And as friends and allies abandon him one by one, Connor discovers that in the clash between light and dark, and in the face of a cataclysm of epic proportions, he might have to make the ultimate sacrifice to save the world. While the city of Boston is still reeling from a terrorist attack, which he’s been accused of, Connor Grey is once again drawn into a case that no one else seems to want to touch. The deaths of fey in the Weird are being ignored by all parties, leading Connor on a trail that makes him question everything he’s come to believe about who he can trust, and who he can’t. 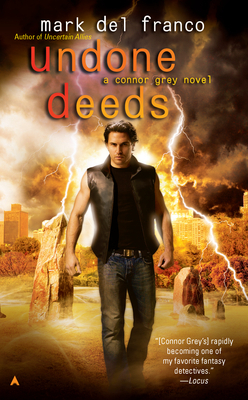 As well written as Undone Deeds is, it isn’t a book that’s easily absorbed as a standalone. Having only read the previous novel, Uncertain Allies, I was at a loss as to the role of various characters, as well as some of the rules of Del Franco’s world in which they interact with one another. Although many of the earlier chapters of the story devote a great deal of time to pertinent backstory happenings, I still had a lot of questions that went unanswered. Having said that, I think Del Franco has created an incredibly intricate world with plenty of blind corners and suspense. It is an understatement to describe Connor as “complicated.” He is damaged, stubborn, fiercely loyal, uncertain, suspicious, loving…the contradictions seem limitless. But, I truly like Connor. I found myself firmly on his side, regardless of any questions I may have had. Nothing in his world is as it seems, including himself, yet he never rolls over to wallow in despair. With all the dark happenings going on in the Weird, and the inevitable war brewing between the factions, Undone Deeds could have been a bleak, unrewarding read. However, Del Franco has imbued his characters with wit, intelligence, and heart, and even with the world on fire around them, they never give up hope. Amid the destruction, the mystery surrounding Connor steadily deepens, teasing with more unknowns than there seem to be answers for. I feel an investment Connor’s story from the very beginning is necessary to fully appreciate what Del Franco has accomplished with this series. He’s packed an impressive amount of intricacies into Undone Deeds in order to answer questions that have been building throughout the story arc. Although I’m increasingly bothered that I missed out on the previous stories in this series (a fact I intend to rectify as soon as possible), I believe this is a series worth investing in for any fan of Urban Fantasy.